Catalog » Fire FAQs—What is forest fuel, and what are fuel treatments? The forest floor before fuel-reduction treatment. The forest floor after fuel-reduction treatment. Photos: Deschutes National Forest. The three components of the triangle: fuel, topography, and weather. Wildland fire management strategy has shifted over the past two decades as land managers worked to change one of the primary characteristics of forests that makes them prone to fire: the overabundance of fuel. Fuel is the combustible biomass found in forests. Fuels include everything from needles, grasses, and small twigs (“fine fuels”) to progressively larger fuels such as shrubs, branches on the ground, downed trees, and logs. Fuels are also present in tree canopies; green needles and fine branches are known as “crown fuels.” Fuels can be either living or dead, and can be arranged vertically (referred to as “ladder fuels”) and horizontally across areas as small as a clump of trees, a forest stand, or as large as a watershed. Homes and other structures are also considered forms of fuel. These fuel-reduction treatments generally target dry forests adapted to frequent fires of low to moderate severity, although wet forests are treated to a limited extent. Research has shown that a combination of treatments works best to achieve these goals and reduce the intensity of future wildfire. For example, thinning followed by prescribed burning provides the greatest reduction in wildfire intensity and severity in dry forests in the Intermountain West—more so than thinning or mechanical treatment alone. Maintenance is an important consideration in reducing fire risk. While fuel treatments have been shown to remain effective for up to 10 years, they lose effectiveness over time, depending on forest type and productivity. Forests or vegetation dominated by understory shrubs may need to be treated every five years or so. Fuel reduction treatments must be maintained or repeated to remain effective. How do fuels and fuel treatments differ between wet and dry forests? Wet forests of western Oregon typically have greater amounts of fuel due to higher productivity, both on the surface and in the canopy, than dry forests. In the wet forest, fire is primarily climate-driven and can burn with high intensity when conditions (low rainfall, high temperatures, low humidity, and sustained winds) are right. Steep and complex topography can also influence fire intensity. While fires don’t happen often in wet forests, when they do occur they are usually “stand-replacing,” meaning the fire kills most of the vegetation. Due to the ecology and high productivity of these forests, large-scale fuel reduction treatments such as thinning and prescribed burning may not be appropriate. However, fire managers recommend thinning to reduce the potential of crown fire when wet forests intersect with homes and other important resources in the wildland-urban interface. In dry forests, fuel buildup was historically limited by frequent, low- to moderate-severity fires that—rather than kill a large proportion of the trees—maintained open stands dominated by large, fire-adapted species. But today, many areas feature an overabundance of fuels due to a combination of factors: a century of fire exclusion; the eruption of new trees and shrubs in the absence of fire; and past management practices that prioritized removal of the largest, most-fire resistant trees without adequately managing subsequent forest density. Today, wildfires that burn in these dry forests often burn at a much higher intensity, resulting in large patches of stand-replacing fire. As a result, dry forest types that were once dominated by frequent, low- to moderate-severity fire often require more aggressive stand and landscape treatments, using fuel reduction principles to reduce and rearrange fuels. Do fuel reduction treatments work? The effectiveness of treatment depends on how closely the principles of fuel reduction are carried out and maintenance of treatments over time. Variables include the amount and distribution of fuel left on site, the size of the area treated, and the intensity of the fire driven by the other two components of the fire behavior triangle: weather (factors such as wind, temperature, and humidity) and topography (slope and aspect). 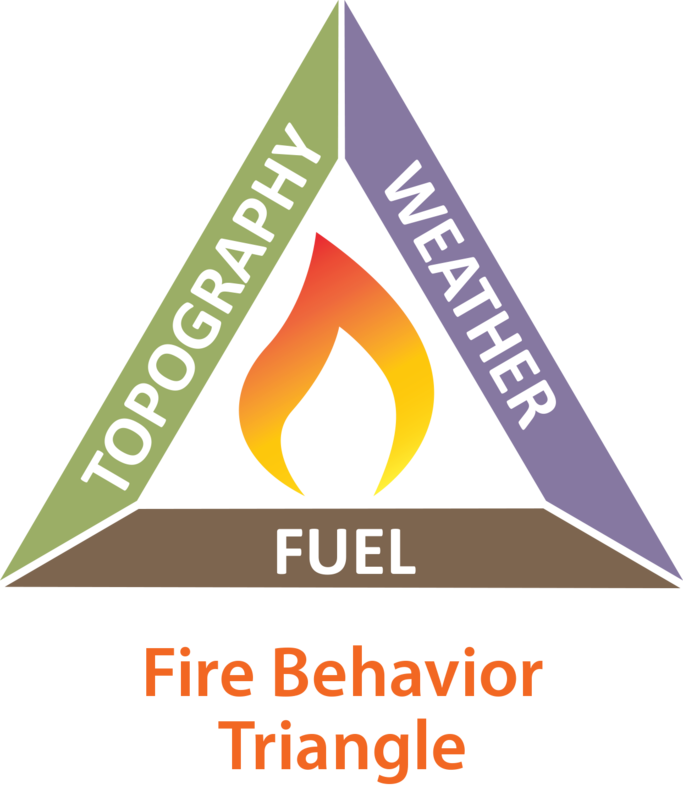 Fuel is one of three components of the fire behavior triangle. If one component changes, the behavior of the fire—how hot it burns and how fast it spreads—also changes. Thinning, mowing, and prescribed burning helped reduce the intensity and duration of a portion of the 2017 Milli Fire in Deschutes County. These actions made the fire easier to extinguish, keeping private lands in the dry forest area protected. 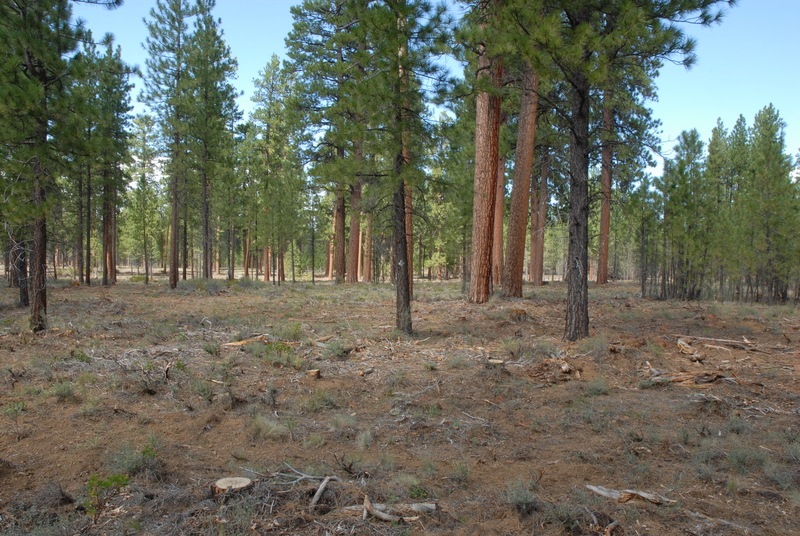 Learn more about the Milli Fire at the Deschutes Collaborative Forest Project. Other examples of successful fuel treatments that reduced wildfire intensity and severity include the 2002 Cone, 2005 Bell, and 2007 Angora Fires in California; the 2011 Wallow Fire in Arizona; and the 2006 Tripod Complex Fire in Washington. Agee, J.K. and C.N. Skinner. 2005. Basic principles of forest fuel reduction treatments. Forest Ecology and Management 211: 83–96. Berger, C., S. Fitzgerald, and D. Leavell. 2018. Fire FAQs: Managing Wildfire for Resource Benefit: What is it and is it beneficial?, EM 9193, Oregon State University Extension Service, Corvallis, OR. Fitzgerald, S. and M. Bennett. 2013. A Land Manager’s Guide for Creating Fire-Resistant Forests, EM 9087, Oregon State University Extension Service, Corvallis, OR. Forestry and Natural Resources Extension Fire Program. Oregon State University Extension Service, Corvallis, OR. Forests and Rangelands. National Fire Plan. Accessed September 7, 2018. Forests and Rangelands. The National Strategy: The Final Phase in the Development of the National Cohesive Wildland Fire Management Strategy. Accessed September 7, 2018. Glickman, D. and B. Babbitt. 2000. Managing the Impact of Wildfires on Communities and the Environment: A Report to the President in Response to the Wildfires of 2000. Secretary Dan Glickman, US Department of Agriculture, and Secretary Bruce Babbitt, US Department of the Interior. Submitted September 8, 2000. Kalies, E.L. and L.L.Y. Kent. 2016. Tamm Review: Are fuel treatments effective at achieving ecological and social objectives? A systematic review. Forest Ecology and Management 375: 84–95. Kennedy, M.C. and M.C. Johnson. 2014. Fuel treatment prescriptions alter spatial patterns of fire severity around the wildland–urban interface during the Wallow Fire, Arizona, USA. Forest Ecology and Management 318: 122–132. Leavell, D., C. Berger, S. Fitzgerald, and B. Parker. 2017. Fire Science Core Curriculum. EM 9172. Oregon State University Extension Service, Corvallis, OR. Martinson, E.J. and P.N. Omi. 2013. Fuel treatments and fire severity: a meta-analysis. USDA Forest Service RMRS-RP-103WWW. Fort Collins, CO.
Moghaddas, J.J. and L. Craggs. 2007. A fuel treatment reduces fire severity and increases suppression efficiency in a mixed conifer forest. International Journal of Wildland Fire 16: 673–678. NIFC Fire Stats. Accessed September 7, 2018. Prichard, S.J., D.L. Peterson, and K. Jacobson. 2010. 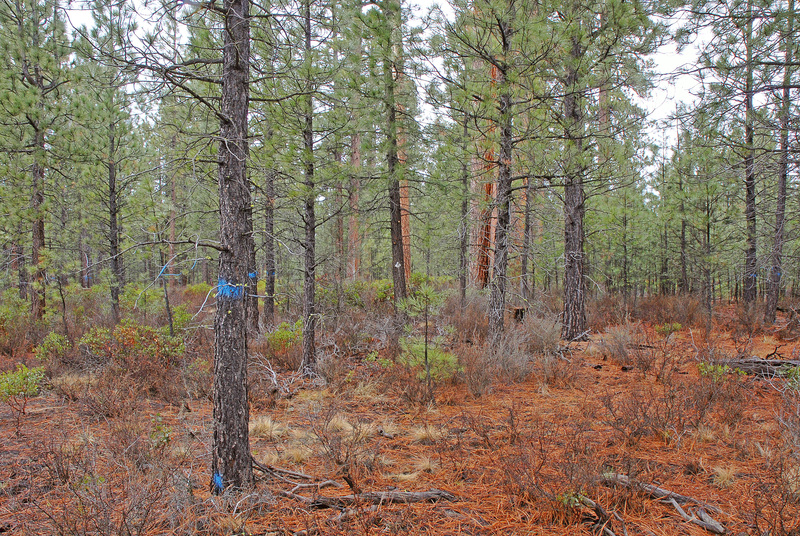 Fuel treatments reduce the severity of wildfire effects in dry mixed conifer forest, Washington, USA. Canadian Journal of Forest Research 40: 1615–1626. Safford, H.D., D.A. Schmidt, and C.H. Carlson. 2009. Effects of fuel treatments on fire severity in an area of wildland–urban interface, Angora Fire, Lake Tahoe Basin, California. Forest Ecology and Management 258(5): 773–787. Simpson, M. 2007. Forested plant associations of the Oregon East Cascades. In: Technical Paper R6-NR-ECOL-TP-03-207. US Department of Agriculture Forest Service, Pacific Northwest Region. Portland, OR. Skinner, C. and M. Richie. 2008. The Cone Fire: A Chance Reckoning for Fuel Treatments. Joint Fire Science Program. Fire Science Brief. Issue 4. Stephens, S.L., J.D. McIver, R.E.J. Boerner, C.J. Fettig, J.B. Fontaine, B.R. Hartsough, P.L. Kennedy, and D.W. Schwilk. 2012. The Effects of Forest Fuel-Reduction Treatments in the United States. Bioscience 62(6): 549–560. Vaillant, N., E. Noonan-Wright, S. Dailey, C. Ewell, and A. Reiner. 2009. Effectiveness and Longevity of Fuel Treatments in Coniferous Forests across California. Joint Fire Science Final Report ID 09-1-01-1. © 2019 Oregon State University.